Greetings one and all! I invite you to pour a cup of coffee or hot tea, find a comfy chair, and take a deep breath. A little break in the day is good for the mind, body, and spirit. Today, I want to reflect on the art of listening—a skill too often discounted or dismissed when there is so much to do! Granted, caregiving entails a myriad of tasks. There is so much to do. However, remembering the power of presence and the importance of being benefits all concerned. So, listen well. My mom taught me the art of listening. Listening came as naturally as breathing for her. Every morning after sending my dad to work and my older brother to school, Mom and I would venture out to visit a neighbor. To this day, I don’t know how she knew which neighbor needed a listening ear and a compassionate presence. But, we always ended up at the right house. Mom just knew. Once seated at the kitchen table—where all important conversations occur—we sipped hot tea and listened to the joys and the sorrows of our neighbors. My apprenticeship began at a relatively young age. I was probably four years old when Mom initially invited me to accompany her. I remember the conversation well. She stressed that I was to “mind my manners.” To sit quietly unless directly addressed. To graciously receive the food and drink offered. And to thank each neighbor upon our departure for their time and hospitality. She made sure I understood the process and my role in the scenario. Looking back, I realize Mom wanted to ensure I felt comfortable and included in the process. She was an amazing teacher as well as listener. After Mom died in 1981, people from far and wide expressed their condolences as well as their gratitude. I knew Mom was an amazing spirit in this world, but the stories of others confirmed what I knew to be true. Her willingness to listen was a rare gift indeed. In the presence of my mom, others felt honored, respected, important, and heard. 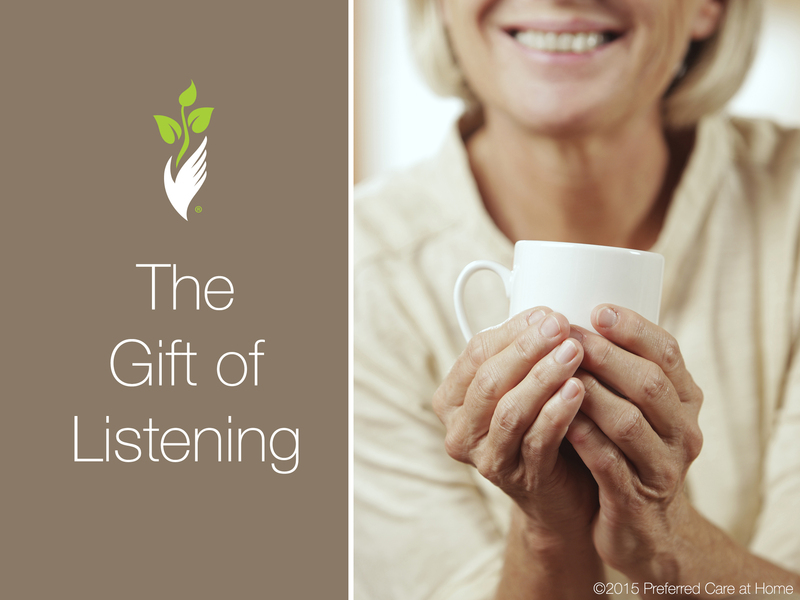 Mom’s ability to listen well evidently transformed the lives of countless people. Listening was her gift to the world. I chose to share a bit of my mom’s story with you to highlight the value and the importance of listening. In this day and age, how often do we truly listen to one another? It’s hard, isn’t it? Technology intrudes at every turn. Multitasking is necessary, encouraged, and celebrated—particularly when it comes to caregiving. Consequently, we’re so busy doing that we’ve forgotten how to be with each other. But regardless of the hectic pace, the reality is this. Caring for others begins and ends with listening. If we listen well, we increase the likelihood of serving well. A gift indeed. Are you a family caregiver looking for more resources to equip you? Visit Preferred Care at Home’s Family Learning Center for free online modules and subscribe to the Senior Home Care Blog to stay up to date on senior care posts.